Surely it bests even Randy Campbell’s 1984 ode-to-Bo reworking of “Mr. Bo Jangles” on the short but proud list of musical tributes to Auburn players. And it was Mark Stewart’s first ever upload to YouTube. 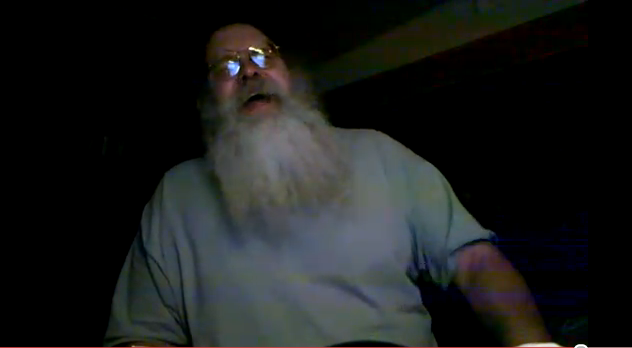 TWER connected with the 53-year-old bearded balladeer via the Android phone he used to record his baptism into Cam Consciousness to find out a little bit about him (currently works at Red Stone Arsenal in Huntsville, born at East Alabama Medical Center in Opelika where his father served as hospital administrator in the Year of Our Championship 1957, graduated – Rebels represent – from Vestavia Hills in Birmingham in 1975, attended Auburn from ’75-76) and just what it is about Cam Newton that led him to film himself covering Paul Simon’s “50 Ways to Leave Your Lover” as “50 Ways to Win the Heisman”. TWER: So where did you get the idea for the song / video? I was watching ESPN the other day and they were talking about Cam Newton and about how many ways he can beat you. And it just popped into my head. And Paul Simon, he wrote that song the years I was at Auburn. And it just popped into my head. I’ve always enjoyed that song. I’ve never made a video for YouTube in my life. I enjoy watching YouTube. But one thing led to another and I had some free time and I just sat down and wrote it out. I just had my cell phone [laughing] and just recorded it while I was practicing it and decided to upload it. I had fun with it. TWER: Have you gotten a reaction? Yeah, from family and friends and people I work with. Here’s what I’m thinking – he doesn’t have much of a campaign. He needs a campaign. I thought that’d be my contribution. All the Heisman guys over the years won because of big campaigns and he seems a real laid back guy and probably doesn’t enjoy all the mass attention. TWER: So… Team of Destiny? I hate to jinx it, but it’s lookin’ good. We gotta beat Alabama and Alabama is a great football team and I don’t know that they think that Auburn is going to beat them. All the Alabama fans I work with, they don’t think Auburn can beat them. But there’s something about this team. I really am a big Auburn fan. I don’t get to get to the games much anymore, but I’ve kept up with them all these years, and there seems to be a chemistry on this team like no other team I can even remember. I don’t know. Cam Newton just seems to be the glue that’s holding it together. It was a special athlete to come down there and I don’t think Gene Chizik has gotten his due. Pat Dye cam in and turned it around his second year. It’s like history is repeating itself in a way, I hope. TWER: If it turns out as good as it can, but Newton decides to turn pro before his senior season, won’t it be weird to think back on this one, glorious “Season of Cam”? Well, I’ve thought about that a lot. The way I see it is this: I see myself as kind of like those old Red Sox fans. There was a movie about Red Sox fans and I don’t know if you saw it but they interviewed all these old people, these Red Sox fans in the 80s, who’d never seen the Red Sox win a World Series and they were saying ‘just one, I’d like to see just one before I die. Please, just one.’ Well, my brother died a few years ago, he died before his time. He was just nine years older than me. And well, he didn’t get to see it. And I sorta feel that way. Just once… just once. Please win it this year. Just once. I don’t want a dynasty. I don’t want to be an arrogant Alabama fan counting championships and fudging them. Just one would be fine with me. And if he helps us win this one, just one, that’s fine with me. That’d be enough for me. Seriously. I want to see him stay, but he’s got to do what’s right for him. TWER: Was there a particular moment or play that made you realize that he might be special? Well, I guess he had a couple of really good runs early on. That one at Mississippi State I think where he got away. And of course that 49 yard run against LSU. That was incredible. I watched that play on DVR several times. He outran the fastest guy on the field and that Peterson guy, he carried him eight yards into the end zone. It reminded me of the time Bo Jackson bowled over Brian Bosworth. TWER: Are you working on another song? TWER: Is it another reworked cover? An original? [Laughing] A cover — no, I’m not a songwriter. But yeah, one more and that’s going to be it. It’s going to be to “Solitary Man” by Neil Diamond but Heisman Winning Man. I think it’ll be better than the first one. I’ll probably have it up at the end of the week, hopefully before the next game. I sort of have a hard time believing that people like that video. TWER: Man – it’s awesome. It’s a good idea. Especially with your explanation – exactly… 50 ways to win the Heisman… and you made that before the Ole Miss game, right? Right, recorded it and put it up there right before it. There’s a reference to the upcoming Ole Miss game in there and I worked hard to get it up there before that game. TWER: See… there you go… and he goes out and catches a touchdown pass for the first score… 51 ways. Yeah, that worked out pretty well. One of the guys at work said he might be the first guy to ever throw a touchdown pass to himself. Throw it and run and catch it. If anybody can do it, it’s him. There came this junior college football playing dude. 50 ways to win the Heisman. All of them were vying for that elusive trophy. Now there’s only one left standing there for all to see. There must be 50 ways to win the Heisman… 50 ways to win the Heisman. Run down the field, Bill, and score a TD. Another first down, clown, and that is the key. When they saw the numbers they all thought it was a fluke, but now the Gator fans are trying hard not just to puke. How in the world could they have left that prospect off the hook. There must be 50 ways to win the Heisman. With the Alabama rivalry of renown, that leaves 50 ways to win the Heisman… 50 ways to win the Heisman. Quick snap the ball, Paul. Thanks to reader Ronnie Hardy, you can now download the song as an MP3. And now, thanks to reader Todd Smith, you can now download the official Quarterback Draw, Y’aaaallll ringtone. Can any of you knowledged interwebs people clip out and make a mp3 ringtone of “Quarterback draw, Yallllllll!” That would rock. Also, I would pay a buck for an mp3 version of the whole song if it was on Amazon mp3 or even itunes. This dude is legit! And what an awesome beard! Todd, there’s a website where you can convert youtube videos into songs for free. Just google search for it, and it should come up pretty quickly. Okay, I am about to prove myself a dork. But there should be a way on YouTube to download the audio of a video as an mp3 (I know there is on Firefox if you have that particular add-on). From there, the website mobile17.com allows you to clip free ringtones from your own mp3 files and send them to your phone via email or text message (or a variety of other ways). You have to sign up for the website, but I’ve used it since college and it’s totally free and legit. There is an express version that you can pay a dollar and it’ll expedite the process, but the free one takes 2-3 hours for delivery. I find that to be worth it for free ringtones. Love this video. Love this guy. Love it! Love it! Love it! ask and ye shall receive, awesome! thanks everybody, war cam eagle! I actually liked the other one (better) http://www.youtube.com/watch?v=rENWZEugjZ4..not saying this one isn’t good…but…instead of your opinion being the “gauntlet” why don’t you put it to your readers to vote? ?